A 58-year-old woman has tested positive for hepatitis B after being unwittingly exposed to the virus at a surgical facility in New Jersey. The unidentified patient is the first to come forward and file a claim against the center, which says up to 3,778 people may have been exposed to HIV, hepatitis, and other blood-borne pathogens. 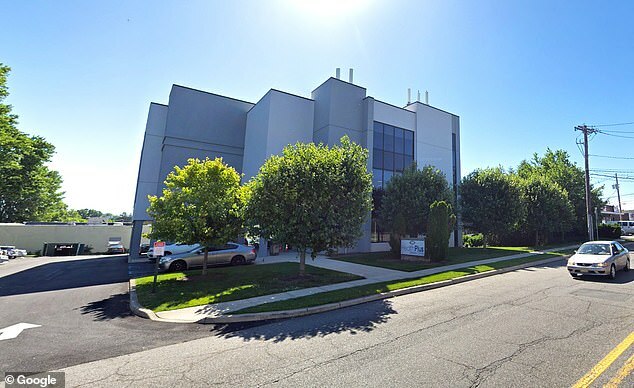 Her claim comes a week after health officials said sterilization issues plagued HealthPlus Surgery Center in Saddle Brook, New Jersey, between January 1 and September 7, 2018. According to a state report, poor drug storage methods, an outdated infection control plan and unacceptable sterilization practices were rife. Filing a claim in her home borough of Brooklyn today, the woman’s lawyers accuses HealthPlus of ‘recklessly and negligently’ failing to follow sterilization and other procedures. The lawsuit, which seeks class action status, asks for unspecified damages. 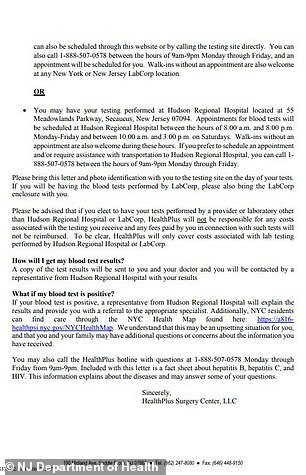 ‘I needed to be checked for HIV and hepatitis,’ the letter said. The letterhead showed that it was from HealthPlus Surgery. Two employees have since been fired, officials said. And now, there’s a lawsuit – likely the first of many. The legal action, brought in US district court in Brooklyn, accuses HealthPlus of ‘recklessly and negligently’ failing to follow sterilization and other procedures. The lawsuit, which seeks class action status, asks for unspecified damages. HealthPlus attorney Mark Manigan said state health officials still must conduct a ‘comprehensive analysis’ to determine, among other things, if the positive test result reflects a pre-existing condition. ‘To our knowledge, no infection has been linked to exposure at HealthPlus and definitive results may be weeks or months away,’ Manigan said in an emailed statement. 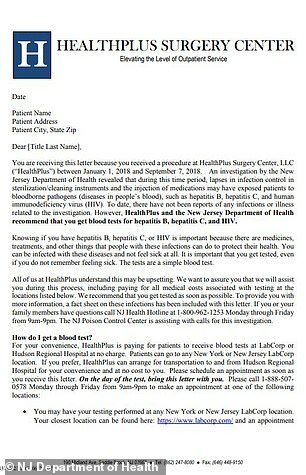 HealthPlus notified the patients last month that ‘lapses in infection control in sterilization/cleaning instruments and the injection of medications’ may have exposed them to the diseases, and offered to reimburse them for the cost of testing. Another former patient filed a lawsuit in a New Jersey state court last Friday alleging that HealthPlus engaged in ‘wanton misconduct — on a continuing basis’ by exposing patients to dangerous pathogens.